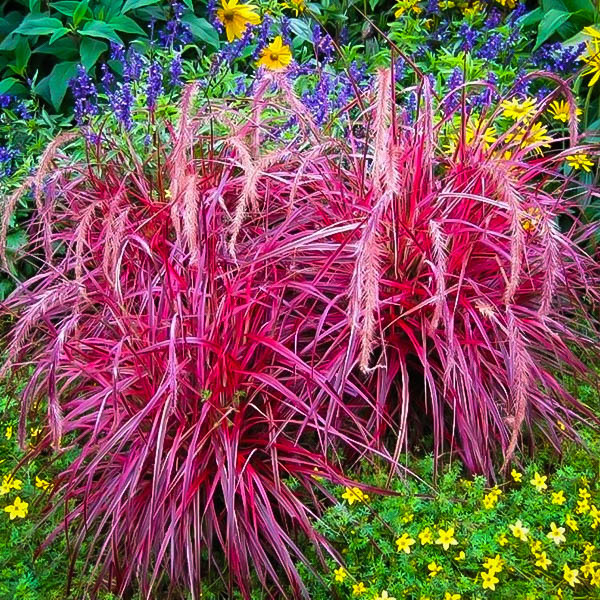 Fireworks Fountain Grass is one of the most colorful ornamental grasses available. This explosion of color features leaves that are striped burgundy, green and white, which glow deep pink to purple from a distance. Even the flower stems and seed heads are purple-pink, so the whole plant is vibrant with color. It grows into a fountain of foliage and flowers, up to 4 feet tall and 2 feet wide – a real show-stopper. 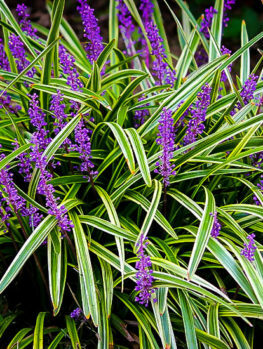 This grass is easily grown in any sunny place, and it looks great among flowers and small shrubs. 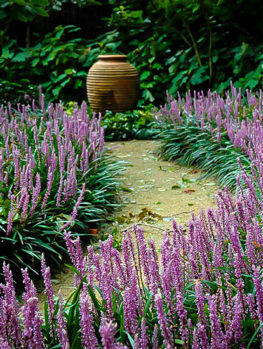 Once established it is drought-resistant, so it needs very little care. Use it in containers and planters, for instant color without needing to plant flowers. Wherever you grow it, this plant will stop the show. Fireworks Fountain Grass is hardy in zone 9 or warmer. In cooler areas it is fast-growing, and it can be used as an annual plant. You can also overwinter it in a cool, frost-free sunny place, and replant in spring. This easy grass needs no unusual care, and grows well in poor soil, and hot, dry places. Water regularly for the first few weeks, and after that only when the soil is dry. Fertilize in spring with slow-release fertilizer for the most vigorous growth. It has no notable pests or diseases, and deer usually leave it alone. If you think that all grass is green, think again. 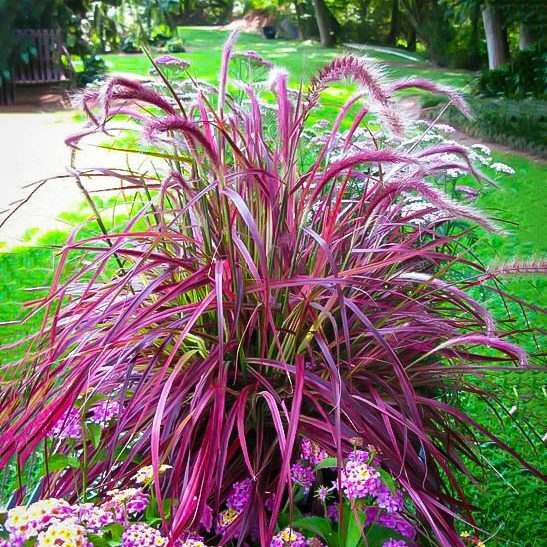 Fireworks Fountain Grass is just what it sounds like – an explosion of vivid color in a fountain of narrow leaves and flower spikes. 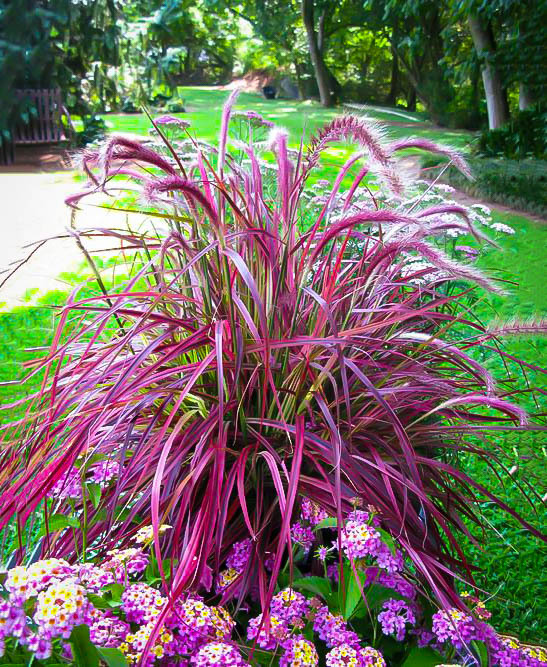 This beautiful grass grows 3 to 4 feet tall, and 2 feet across, and it is a vivid fire-ball of red and purple. Every leaf is striped from top to bottom in narrow bands of burgundy, green and white, and the flower spikes are a bright red-purple color. 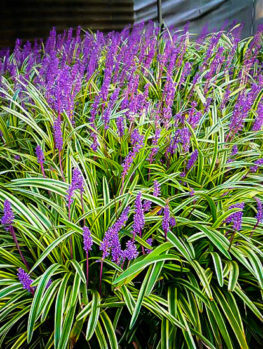 This beautiful grass is an easy way to bring vibrant color anywhere in your garden, from beds to planters. Fireworks Fountain Grass has long, narrow leaves, banded in vibrant color. 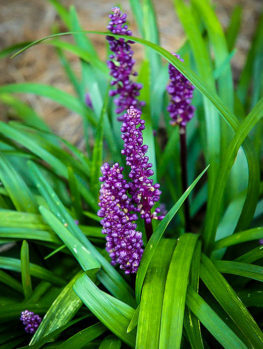 It forms a dense clump with arching leaves, and in summer, from within those leaves, sprout many flowering stems, which are purple in color – the stems and the flower heads. These fluffy heads are around 9 inches in length, and they add interest as well as color to this plant. The overall effect is a fountain of purple, pink and burgundy, which lasts and lasts for months. Although it flowers profusely, this variety does not produce any viable seed, so it cannot spread in your garden, or into surrounding natural areas. Even in places like California, where the wild form of this grass has escaped, you are completely protecting your local environment when growing this sterile grass. This colorful grass has many uses around the garden. 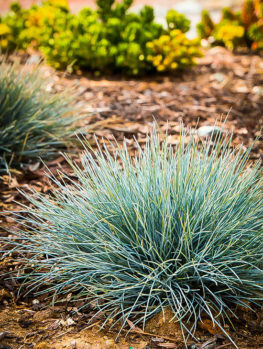 Combine it with plants in complementary colors, such as blues and pinks, among perennials and smaller shrubs. 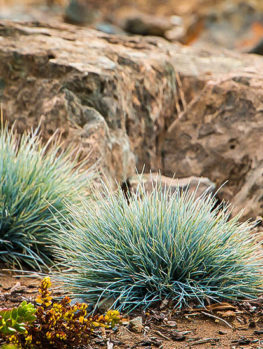 Use it to bring color to plantings you create with other ornamental grasses. It is a wonderful container plant, alone or with other plants, and allows you to have lots of color without needing to plant flowers. Wherever you use it, you will love how easy it is to bring an explosion of color into your garden with this tough plant. 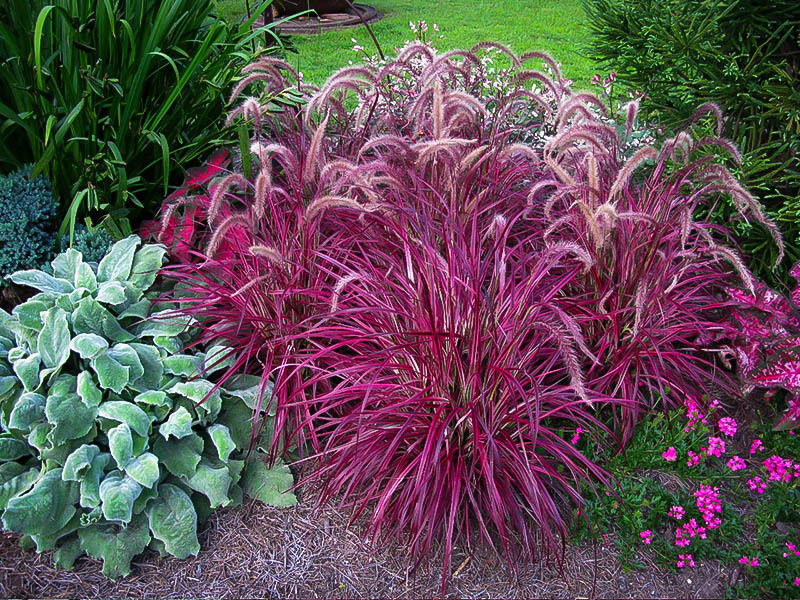 Grow your Fireworks Fountain Grass in a sunny place, for the best color development. 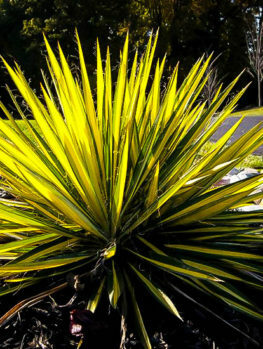 Once it is established it is very drought-resistant, and it needs almost no care. Some slow-release fertilizer applied in spring is helpful in giving the maximum growth, but it is not necessary in most situations. This tough grass thrives in drier conditions, and it grows well in any well-drained soil. It has no significant pests or diseases, and it is usually left alone by deer. Fireworks Fountain Grass is hardy in zones 9 to 11. If you live in hotter parts of the country it will grow through winter. Just trim back in early spring, so that you have plenty of fresh new leaves for the summer. In colder areas it is easy to overwinter your plant, if you have a cool, sunny place that does not freeze, like a porch or windowsill. Lift your plant before the first frost arrives, and trim off the seed stalks and any older leaves. Plant it in a pot big enough to contain the roots, and bring it into that cool, sunny place you have chosen. Keep it dry, only watering when the soil is almost completely dry. In spring, once the night temperatures are over 40 degrees, plant it back outside again. Fireworks Fountain Grass is a form of African fountain grass, Pennisetum setaceum. It grows naturally throughout most of Africa, the Middle East, and into Western Asia. Its natural habitat is open, dry areas dominated by grasses and other drought-resistant plants. 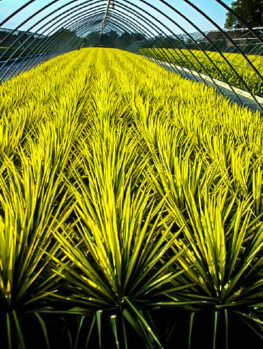 It is adapted to grow well at high temperatures, and consequently it is not frost-resistant. The natural flower-spikes have a pinkish to purplish tone, and there is a lot of natural variation between individual plants. Gardeners have selected over the years forms with darker red foliage and seed heads, so that these are usually the forms seen, and this plant is often called crimson fountain grass, although the wild form is green. These colored-foliage plants are usually grown by division, not seed. A prominent and widely-grown form is called ‘Rubrum’, with deep pink coloring uniformly covering the leaves. One day, in the spring of 2004, Ronald Strasko, owner of the wholesale Creek Hill Nursery, in Leola, Pennsylvania, was looking at some plants of ‘Rubrum’, when he spotted a shoot on one that was different. He separated IT and grew it into a full-sized plant. It was striped, not plain in color, and it was so colorful he called it ‘Fireworks’. This plant was patented in 2006, and our plants come from a top-quality licensed grower, and are grown by the division of plants derived from that original find, not by seed. There are other, cheaper varieties of this grass, but nothing surpasses ‘Fireworks’ for brilliance and interest. Since its introduction, this plant has been very popular with everyone – and no wonder. Our stock will only be with us a short time. The demand is high, so order now while we can still satisfy you.